Not interested in any of my trades? Just let me know if not. Sorry I didn't see anything, I have birdsnest. I should have answered you sooner. It sounds like the frogspawns are awful similiar, maybe you could post a pic. If anyone else sees something they want to trade for with someone else go ahead. The more trading everyone does the better. Don't be afraid to post questions to others. It's all good, are you a 'shroom kinda fella? I've got 4 different kinds, this one being my favorite. That's with the full day time lights running, it glows even under the strongest light. It's awesome. I've got 3 that are about 3/4"+ in diameter. I need to post a thread with everything I have, so I can start collecting some better zoo's. No I'm mainly wanting colorful sps or lps such as frogspawn, hammer, torch, any blastos, brain, open brain etc. I"m trying to get rid of most of my soft corals. The occasional special zoanthid like PPEs or PHEs are of interest. I'm not trying to be hard to deal with I'm just limited in what I want. Not at all, that just helps us know what you're looking for. I'm picking up a Sun Coral here pretty soon, but don't know when/if it'll be ready to frag. That's the same as mine. Thanks for the offer but I don't need that. just wanted to let people know i got my rpe's today and they are a lot sweeter than the rpe i used to have ahenson was great to do business with so don't hesitate to trade with him. Thanks Biogirl shipped and answered emails quickly. Nice trade! I have some nice colored zoo's that are aqua colored with a line through the middle that makes them look like cat's eyes they are very pretty. If they sound like something you'd want let me know & i'll post a pic later. I'd do it now but my batteries went dead in my camera so I need to go to the store & get more first. I live in Oldham Co KY so we could ship priority if your interested. Just let me know. Thanks for the replied and to those for trading. Right now my tank is filled up with new frags. I think I'm done trading till I learn how to take care of my new frags. Sorry I missed this tread. LMK when you have more to trade, I have stuff I think you will be interested in. I have neon green mouths on a brown polyp with a skirt. They are pictured close up in my gallery. Would anyone trade with me? 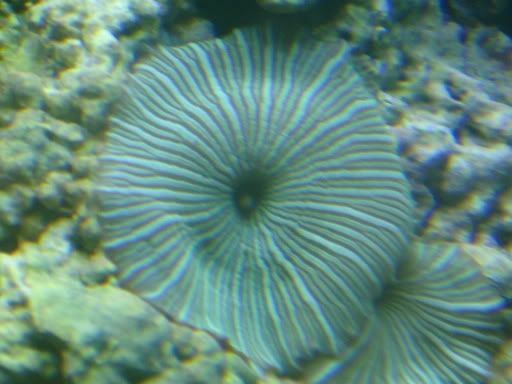 I'd trade 10 polyps of mine for one or two colored zoos polyps. I have a sun coral I can frag too, but someone would have to tell me how. Guess not. Well, thanks anyway! i also have purple caps as well !!! I'll trade later but not for a couple months or so. I don't have a lot left of these left so I need to wait, but I like to trade.